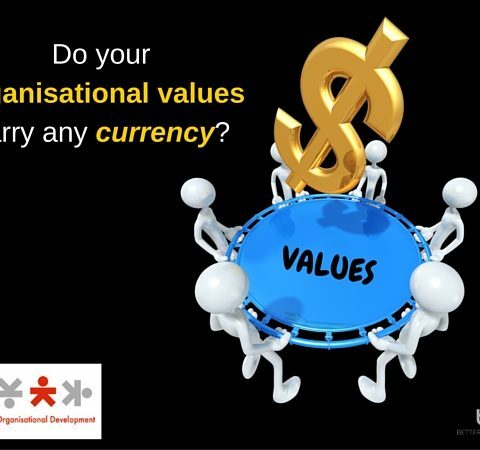 Organisational Values – do they hold any currency for your business? Values: Whats their real value to Geelong & Ballarat businesses? Organisational values (or the idea of them) began to surface in the early 1970’s, but whose origins most likely lie in the work of Kurt Lewin in the late 19th and early 20th Centuries. Despite a general awareness, the experience of the Leadership At Work team is that organisational values across the spectrum of Australian industries are ill-conceived, misinterpreted, intermittently applied or ignored entirely (there are of course a few organisations doing it well…). Organisational values it would seem, are somewhat like the Loch Ness Monster; the romantic notion of her existence is nice, the reality is somewhat different. The question we might ask is: What could happen if we created and maintained the right values? In marketing lingo, we might also ask: what is the value proposition created from establishing and maintaining a set of organisational values? Remember, a value proposition is a statement outlining the expected return on investment and in this we find the first hurdle we face when addressing the above questions, how do we measure it? Without a tool to create scale, a genuine value proposition is always going to be difficult. Clearly, if we fail to describe or understand the dividend of a course of action, our motivation to take it is greatly diminished. If however we do proceed and the fruits of our labour are not reaped or recognised, the results can be calamitous. The next question in our line of enquiry should be: How are our organisational values derived? In recent times, HR departments and Leadership teams have enabled employees to be involved in the creation of organisational values; we applaud the intention and encourage more of it. Managed well, staff can leave feeling involved and motivated with a shared sense of power (one of the critical conditions effective leaders create!). Yet the destination arrived at is more often than not the same; a dusty, dogg-eared laminated A4 poster stating “Our Values…” pinned to a notice board, unloved and long-forgotten. Come on be honest, we’ve all seen them. In order for your organisational values to have genuine value, to be maintained and relevant, they must create a ‘line-of-sight’ to the overall goals of the organisation. They must guide behaviours towards performance we expect. They must dovetail into our corporate themes and strategic plans and when they do, we will start to see value; our value proposition will emerge. The Leadership At Work team are experts at helping you create value in your organisational values. Using tools like GAMs and SOCS we will help you build a values-based culture that is relevant, appropriate and sustainable; a culture that will lift and maintain motivation, discretionary effort and performance and generate the results you expect.